A hot cup of tea is the answer to a lot of things. It will soothe you when you’re sick, warm you up when it’s cold, relax you when you’re stressed. It’s the perfect drink with which to enjoy homemade baked goods and the perfect pick me up to start your day. No matter how or when you like your tea, the tea houses and shops of New Hampshire have you covered. Here are the 10 best in the state. For delicious organic tea, check out White Heron in Portsmouth. Order a hot cup to accompany a homemade pastry or sandwich. Or take a cup to go. Buy loose leaf tea and tea bags, as well as a wealth of tea accessories, too. Enjoy tea at the Cozy Tea Cart or buy some to brew at home. Attend one of the themed tea parties they host throughout the year. Check the website for the next one on their schedule. If you’ve set your sights upon being a tea expert, attend one of the many lectures they host throughout the year. This is also the perfect spot to buy gifts for the tea lover in your life. Akin to a coffeehouse, you’ll often find performances at Teatotaller in Somersworth. You’ll also find a delicious assortment of teas to enjoy with breakfast, pastries, salads or sandwiches. Buy loose leaf tea to brew at home. It comes in cute little cartons. You’ll also find unique tea finds for the connoisseur in your life. The Tea Parlor at Silver Fountain Inn & Tea Parlor serves the most incredible afternoon tea in the region. Two brews are typically served throughout the tea. Mini sandwiches, scones, pastries and more are served on delightful tiered trays. You’ll sip your tea out of delightful cups and saucers and your table is adorned with fine linens. You’ll think you’ve left New Hampshire and gone straight to a tea room from days gone by when you visit here. It’s the perfect place for a private birthday party or bridal shower, too. A&E Coffee & Tea Café serves only quality and sustainable teas. Enjoy a cup at the café and know that the leaves were ethically sourced. You’ll also like the fact that the company donates both their tea and coffee to local charitable events. Choose from black blends or herbal blends. 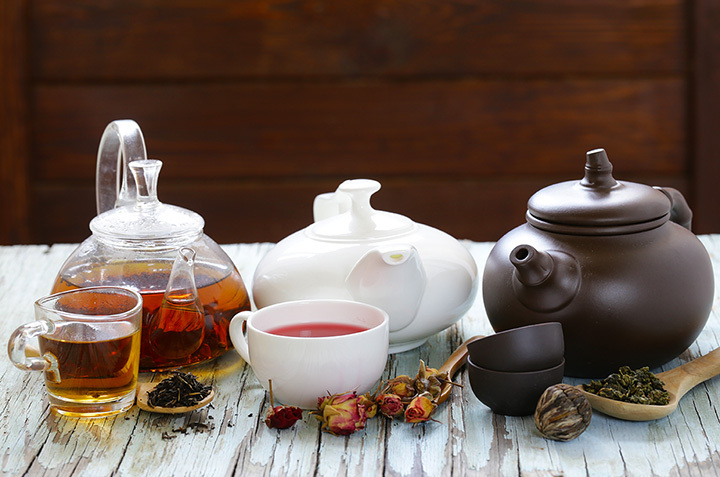 Buy loose-leaf tea and brew your own delicious pot at home. Enjoy a wide variety of teas at Depot Café. Sip your favorite while you enjoy breakfast or lunch. Stop back later for a steaming hot cup for your ride home from work. While many cafes feature lots of coffee options and just a few teas, that certainly isn’t the case here. Tea lovers are pleasantly surprised when they check this place out. In addition to amazing crepes, Seven Suns Creperie in Wolfeboro carries several delicious loose-leaf teas for enjoying while you dine. Their single origin tea, along with their organic tea blends, may be enjoyed in-house or to go. There are also blends available for brewing at home. Yes, Metropolitan Coffee House sells coffee, but they also have an impressive assortment of teas as well. A delicious option is their Blueberry Chai Latte. Rich, creamy chai latte with a hint of blueberry is the perfect way to warm up on a cold winter’s afternoon. Choose from black teas to Green Teas to a variety of Herbals. You’ll find the perfect tea for you at this Coffee House. Choose from a wide selection of loose-leaf teas at the Inkwell Coffee & Tea House. The aroma and flavor are second to none. Sip it with light or luncheon fare. The choices all feature locally sourced ingredients. The Toasts and Baked Goods are especially delicious. Don’t let the “coffee house” part of Schoodacs Coffee House fool you. They have a nice array of tea options on hand, too. In fact, it’s where tea lovers in the region go to both enjoy a hot cuppa or to buy their tea to brew at home. Be sure to check out the incredible selection of baked goods on hand to enjoy with your tea.